A decent murder mystery that takes a while to get going, but is somehow saved from being awful by it’s talented and colorful cast. If Drag Me To Hell showcased director sam raimi at his best (well, since the evil dead movies), then The Gift shows the campy, creepy filmmaker at his worst. Sure, there was spider man 3, with it’s lousy effects, but there was also a lot of story to work with there. maybe too much. The Gift has got pretty much the opposite problem. Cate Blanchett plays a fortune teller. she reads from tarot cards and gives advice to the people who come and see her. She also has three small boys living with her and is a widow after her husband was killed in a factory explosion. the movie introduces us to a number of people in this swampy southern town. there are some that she reads for like Hillary Swank’s abused wife or mentally unstable giovanni ribisi with his father issues. then there are those who live and work in the town and are of the upper class. greg kinnear is one of those, playing a principal at the school and marrying a woman named jessica (katie holmes) of the high society circle. her father is apparently a very prominent figure in this town. we meet these characters over and over again and we even meet hillary swank’s abusive husband donnie barksdale (keanu reeves) who busts in on blanchet’s house and threatens her and her children. with each character, blanchett has things that she talks to them about. and usually it’s the same conversation each time she sees them. with swank, it’s that she should leave her husband. with ribisi, it’s that he shouldn’t be angry with his father and that he shouldn’t feel fear whenever he sees the image of a blue diamond. Blanchet even goes into the school to talk to greg kinnear about one of her son’s who got into a fight and how her son should go see a psychiatrist. blanchet doesn’t like this idea, because she says her son can just talk to her. all of this seems like it’s going somewhere with problems concerning blanchet as a mother. but it doesn’t. in fact, we never hear about the boy again. instead, raimi is using it all just as filler to introduce us to the characters. that’s why he has fiance Jessica walk into kinnear’s office and give him a kiss while blanchett is in a meeting with him about her son. how unprofessional of him to have his fiance just walk in like that. but this movie isn’t thinking in realistic terms. instead, it’s thinking of the fastest way it can introduce us to both kinnear and holmes at once. and on top of that, blanchett gets a vision when she looks at holmes and kinnear standing together, about the horrible things that are to come. after the introductions have gone on for a while, we come to a party for the couple that is to be married. blanchet shows up with a friend, and catches holmes cheating on kinnear with another man (gary cole) in the bathroom. this leads to the big event of the movie, which happens the next day when jessica turns up missing. Blanchet has a dream where she sees jessica’s half naked body floating in a tree, with a chain wrapped around her. she goes and tells the police about it and the head policeman (jk simmons, always great in everything he touches), doesn’t really buy into any of it. he’s pushed to listen, however, by the girl’s father. and so he does and goes along with following where blanchet’s dream would lead him, to the lake of donnie barksdale. Once at the lake, they are able to drag up the body and then to put donnie barksdale on trial. the trial is only about the mid-portion of the film. that’s because so much of the movie was spent just introducing us to the many characters and getting us to the moment of jessica’s disappearance. barksdale is found guilty and everything seems good and right again. that’s when blanchet has another dream and awakes from it convinced that barksdale is not the real killer. 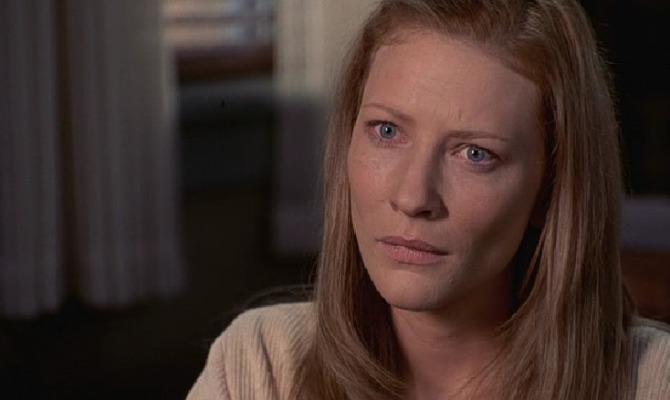 she tries to get lawyer gary cole to reopen the case, but he just laughs at the idea, even after blanchett tells him she knows of him sleeping with jessica. at this point the movie is in it’s final act and heading towards an ending. giovanni ribisi has his climactic moment in the way he deals with his father and blanchet is just trying to get someone to listen to her. she ends up going out to the lake and learning the truth. The Gift has some nice, eery atmosphere and some interesting parts, but it is never fully captivating. we never really feel like we’re involved in a mystery or investigation and the small moments where we start to feel this way are ended and resolved way too quickly. the search for jessica is exciting, but then they pull up the body from the lake and it’s over. the trial of donnie barksdale is also exciting, but once it’s over, the conflict has been resolved. and when blanchet wakes up saying the wrong person is in jail, it just feels tiring. sam raimi is a good filmmaker, but this script, (written by billy bob thorton), has too many characters and not enough story. what if there were no giovanni ribisi character, for example, and instead the investigation included new twists and red herrings and other possible suspects? It could have been a much more exciting film. I didn’t love what raimi did with A simple plan, but it was certainly a lot better than this.